Patrina Allen came to Miami with speed to burn and a knack for helping her teams compete for titles. 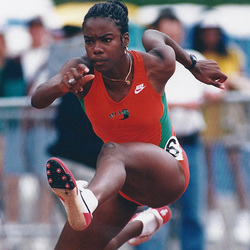 The Palm Beach County Female Athlete of the Year in 1994, led her high school, Palm Beach Lakes to two state championships in track and was inducted into the county's Sports Hall of Fame. At Miami, she blossomed into a world class sprinter, becoming a six-time All American, tied for the second most in UM history. She is the only Hurricane to earn the honors in four different events...the 55 meter hurdles, 100 meter hurdles, 400 meter hurdles and the 4x100 meter relay. She gained 3 All American honors as a freshman, the only Hurricane to accomplish the feat. Patrina also won six BIG EAST outdoor titles in her career, more than any other Cane, including three consecutive 400 meter hurdles titles from 1996 to 1998. Allen participated in 2 Olympics for her native country, Jamaica, competing in the 400 meter hurdles in Sydney in 2000 and Athens in 2004. She enjoyed working with, and wants to give thanks, to UM track Coach Amy Deem, a UM Sports Hall of Fame member, for the hours she invested to train her to become a world class hurdler. Patrina graduated the university with a Bachelors of Science degree in Nursing (BSN) and works as an RN in the Intensive Care Unit. Married to 3-time Canadian Olympic sprinter and former Hurricanes assistant track coach, Atlee Mahorn, they have 3 children, Cameron, Ashley and Jayden. She also enjoys her volunteer work at the Oasis Compassion Agency, that helps the needy of Palm Beach County.